Your wedding day is a unique kind of day when your ‘circles’ all come together. It’s not often that you have all the people from different walks of your life in the same room at the same time. How wonderful to look around and see the people you love just there for you two. Photographs are a brilliant way of capturing who celebrated your big day with you, plus traditionally guests sign a keep sake book and leave a poignant message for the happy couple to read back after the special day. This lovely tradition has got some modern updates and ingenious alternative ideas. 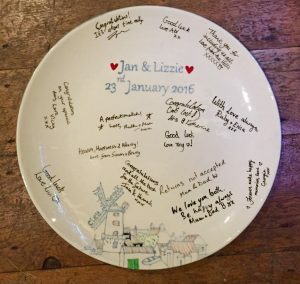 Create a beautiful and highly personalised platter or serving plate, design it with a painting of your venue or of the happy couple and have it glazed and fired ready to present at your wedding along with a special ceramics pen that guests can use to write their message on the plate. Busy Brush Cafe offer wedding plates of all shapes and sizes that can be used every day in the kitchen or hung up on the wall for decoration. Spend a couple of hours in the quirky and supportive cafe environment and have fun painting up your own plate, or have one of the team design it all for you to specification. The plates can then be collected a few days later once they’ve been glazed and kiln fired and the team will provide you with a permanent ceramics pen for guest messages that will last a lifetime! Prices range from £40 to £150 depending on size and detail required. Fancy Features make Giant Colouring In – fully personalised artwork hand illustrated to canvas ready to get coloured in by you and your friends at your event. We design and deliver artwork to clients all over the world. A small family business located in Somerset, who are passionate in bringing a niche service to wedding stationery. Producing beautifully detailed pencil sketches of the couple’s wedding venue or church which are then used as a theme throughout the wedding stationery products. Choices of colours, font styles and wording of invitation according to your needs ensures a personal and unique touch to the couple’s stationery. “Designed exclusively for You”. 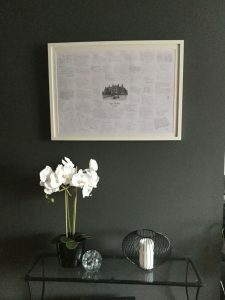 Our Guest Comment Frame is proving particularly popular for its uniqueness as we go one step further than to just leave a blank space for guests to write on at the reception. We provide guests with ‘message cards’ for them to write on during the reception, which has proved to be a great talking point after the speeches have been done and dusted and a lull in the proceedings whilst coffee is being served. After the honeymoon, the couple send us the cards to be edited onto the frame and these original cards are returned together with the completed frame. Our specialty is that we either print or scan the original messages onto the frame around the sketch, ensuring that perfect spacing and an overall pleasing look is achieved. Providing this in either a black or white modern frame, this product not only doubles as a great keepsake but great to hang proudly in the home as a reminder of the Special Day! Our hand-engraved, solid oak keepsake boxes make the perfect wedding gift for the happy couple! Perfect for storing treasured wedding keepsakes and mementos, you can make this gift extra special by adding a personalised engraved date to mark the special occasion! Handmade to order in our studio, our solid oak wood boxes have been lovingly designed and crafted using thick, heavy European oak timber. The wood is hand-cut, then individually sanded and treated to enhance the natural grain and preserve the beauty of the wood. Our boxes are finished with a chic hand-engraving and black infill, with the heart arrow finished with a red infill – producing a truly unique style. Finally, our oak boxes are finished with a clear gloss protective varnish to ensure durability and display a stunning finish. These lift-lid boxes are great for presenting and storing cards, photos and other treasured wedding mementos! The wedding tree from Paper Tree Design is a great way to remember all the people who took part in your special day, family members on the hearts and friends written around the tree. 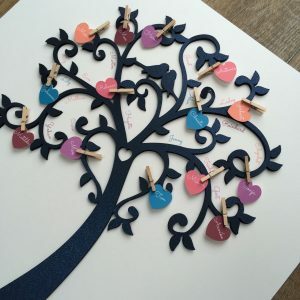 It can be provided fully made up, or instead you can chose to have a blank tree and hearts for your guests to hand write around the tree. Various sizes are available depending on the number of guests, and prices start at £50.00. 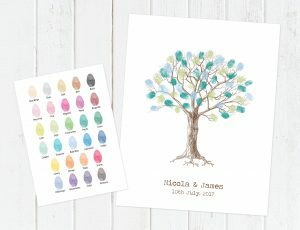 The tree can be colour matched to the colour theme of the wedding, contact suzanne@papertreedesign.co.uk for further details. Living in rural Oxfordshire Suzanne cannot help but be inspired by the beauty of the natural world and the changing seasons, and can frequently be found in lanes and hedgerows with her camera and a sketchbook. 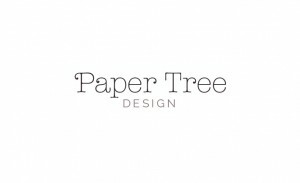 Specialising in paper cutting, at Paper Tree Design we create your handcrafted wedding stationery to order. Choose to personalise a card from one of our ranges or commission a bespoke design. I am at my best working with your theme and ideas for a truly personal invitation and welcome you to come and have a chat and a cuppa in my Oxfordshire studio to discuss plans for your wedding. 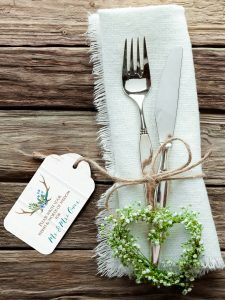 recipegiftbook.com enables friends and family to give a truly meaningful gift to the bride and groom, the gift of a recipe. Create a beautiful keepsake to celebrate your wedding day, a cookbook filled with recipes from all your wedding guests. Whether it’s treasured family recipes or modern favourites, your guests will have fun sharing their recipes, photos and personal messages with you. Guests simply add their recipes online then following your wedding a charming hardback cookbook is sent to you. Creating a ‘recipe gift book’ is a great way to bring both families together in the run up to a wedding. It’s a special cookbook and a wonderful way to collect precious recipes and create something unique to celebrate your marriage. 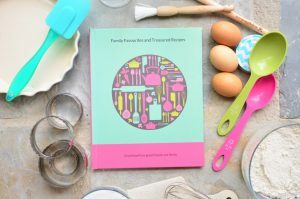 The bride and groom can choose from six recipe book designs and personalise the front cover title to make their book unique. When complete the bride and groom will receive a beautiful hardback book, presented in a gift box. The finished recipe book is free for the bride and groom. The guests just pay £4.99 to add a page to the book. The bride and groom can order additional copies of their recipe book and even allow guests to purchase a copy too. Tree of Hearts specialises in personalised wedding stationery and has over 90 beautiful collections to choose from including traditional, modern, vintage and beach designs catering for a wide range of tastes and styles. They offer quality stationery at affordable prices and have everything you need from save the date cards and wedding invitations to order of service, table plans, fingerprint trees and thank you cards. Free samples are available upon request so you can see and feel the quality of their stationery ensuring it is perfect for your special day. Fingerprint trees can incorporate approximately 50 (small), 80-100 (medium) or 150-200 (large) fingerprints per tree size. Includes a personalised print and 3 small ink pads in colours of your choice. Wishing tree & wishing tags includes a white freestanding manzanita wishing tree (90cm tall) supplied with personalised wishing tags & sign in a design of your choice. The tags can be used for favour tags or wishing tags.